Old photos that bring back memories. I scanned these photos about 8 years ago and uploaded them to a photo sharing website. The site is closing down and I retrieved them before my albums are deleted. I do have them backed up elsewhere, but I wanted to have a second back up, especially of the ones that were originally taken with a 35mm. I scanned the photos and used a photoshop program to clean them up. 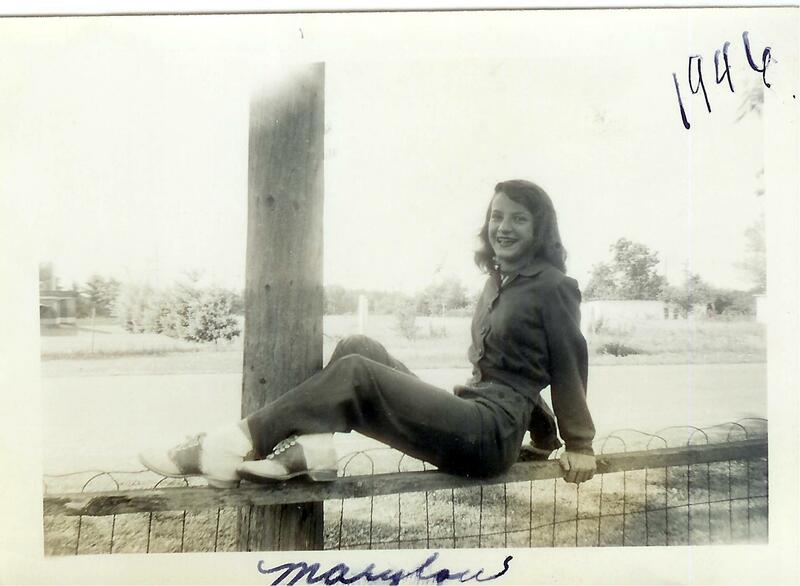 These photos remind me of my mom, because they were taken during that period of time. The resolution on this one isn’t very high. It’s two photos, stitched together in a photoshop program. Also 35mm. 1993, if I recall right. Could have been 1994. We met my mom and dad in southeastern Oregon and camped a couple nights with them just across the border in Northern Nevada. This old stone house was built near a natural hot springs and we camped one night out there on the desert by it. I figured it was public land, since my dad was a Forest Ranger for years in that part of Northern Nevada. Or maybe he just knew the property owner and wasn’t worried about getting in trouble. It was the last summer I had with my mom. The last chance my kids had to get to know her. She died in 1995. She loved that old stone house and I think that was part of the reason we camped there. It was just flat alkali land with scrawny sagebrush and bitterbrush, a few brown hills on the horizon, and jack rabbits. 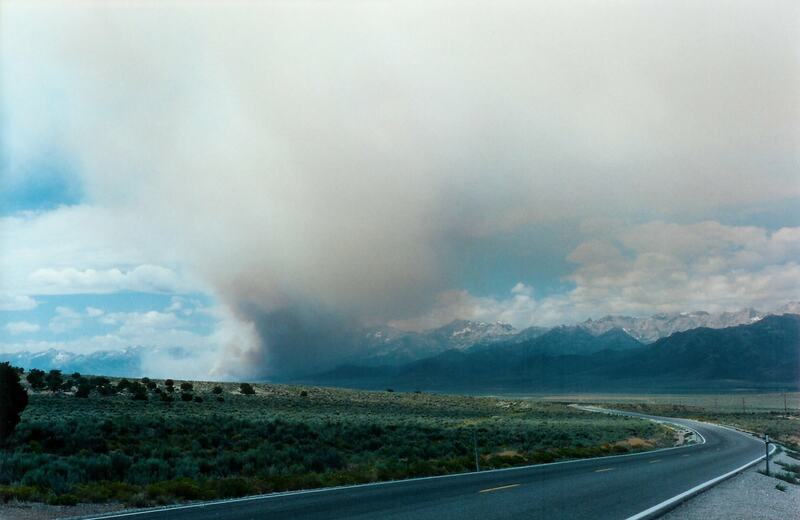 The rabbit brush was tall near the house and hot springs, but otherwise, it was typical windswept Nevada alkali. We took a road trip to Ely after Mom died in 1995. It was early August and most of my photos have never been scanned. We crossed the Santa Rosa Mountains on July 31st and the temperature dropped below freezing. There was ice on our flip-flops outside the tent in the morning. One night, we camped on the Pony Express Trail south of the Ruby Mountains. We just drove out into the tall sagebrush on an old Jeep trail and pitched our tent in a little aspen grove along a dry wash. We counted seven bands of wild horses around us, none any larger than ten horses. The horses were fat, well-built, and very skittish: true Mustangs, not feral horses. I remember telling my dad about them (still awestruck by how close we’d come to some of those beauties) and he told me – for the first time ever – how many times he had come upon true Mustangs in the wild. It was the first time that my dad told me that he loved horses. He had always left me with the impression that he didn’t like the creatures and that he hated the wild ones. The truth was very different from the impressions of my childhood. He didn’t like feral horses and he didn’t like people who didn’t take care of their horses. But he loved the wild ones. It wasn’t just the horses. The coyotes came down in the night and serenaded us: a pack of them, ki-yiing all around us. Our dog whined and tried to crawl under the blankets, shivering in fear. In the morning, while the kids slept in and Don hiked, I had a cup of coffee under a scrubby aspen tree. I sensed something and looked up: a mule deer doe was standing five feet from me, not blinking. She stood there a long minute, processing this strange interloper and the odd structure in her wash before she decided she should turn and bounce away. I love how deer bounce. We held my mom’s memorial service in early August. I think it was the 3rd of August. Stayed a few days and headed back north, still camping along the way. I wanted to take Don through Secret Pass in the Rubies. It was my mother’s favorite bypass over. There was a range fire. I made him pull over so I could snap a photo of the rising smoke. We camped on the Alvord on the way home, up at Pike Creek. Of course, there’s always a drive on the playa involved. I caught this sunrise. I just liked how the shadows played. 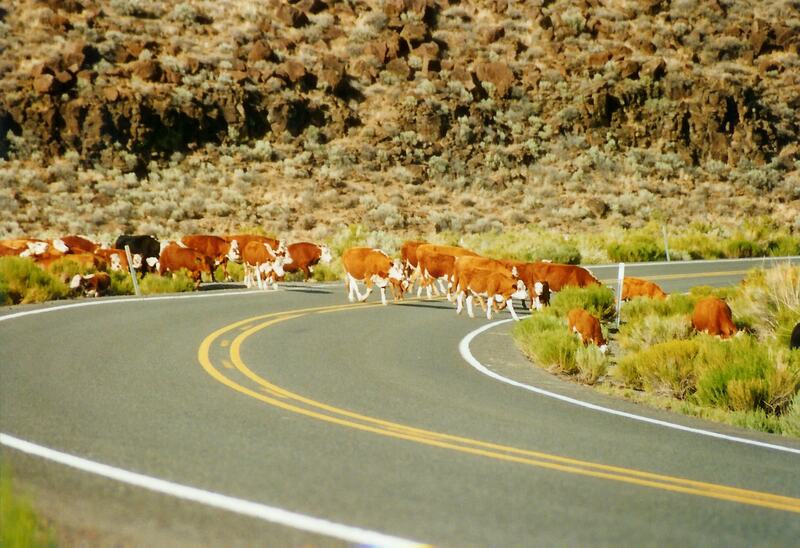 What is a trip to the Steens country without a cattle drive? My mom loved cattle drives. Even liked getting stuck in them. I don’t mind getting stuck in them. Look at all those pretty Herefords. Oh – there’s a black one in there. Gotta mix in the Angus. 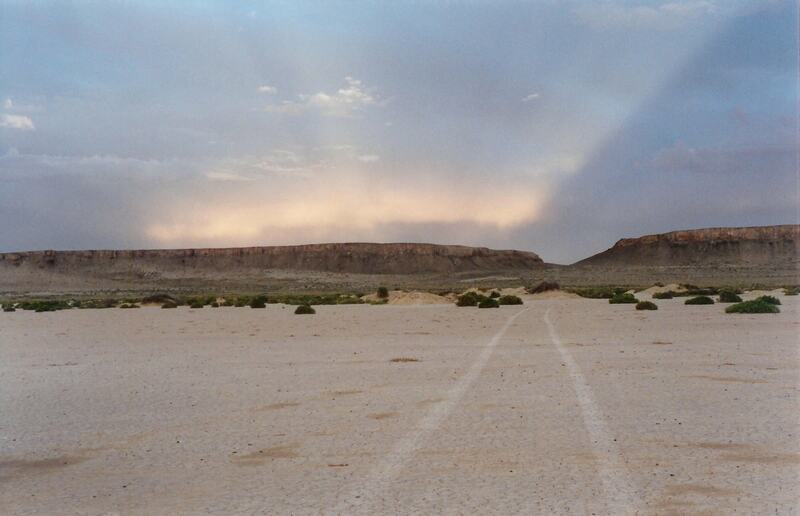 Mostly, we sat in camp at Pike Creek and stared down at the Alvord Ranch and the playa, basking in the hot August sun. I was in mourning and I don’t remember much of the little things we did. 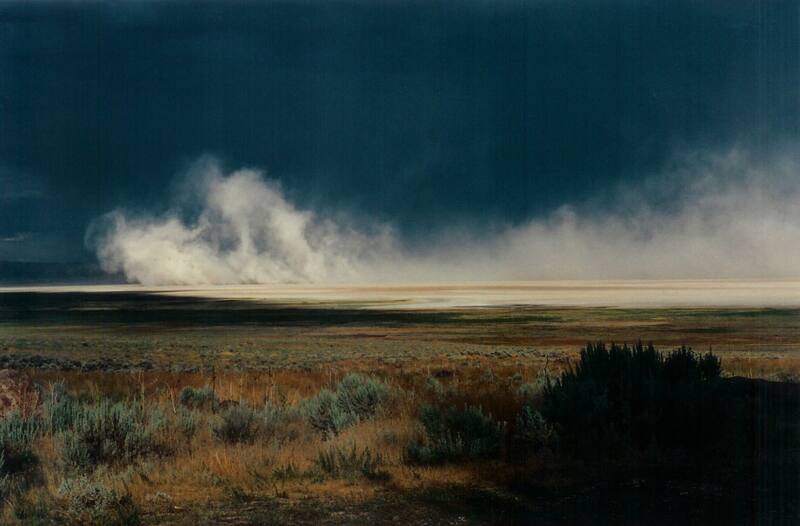 It was one of those summers when there was a lot of alkali on the dry lake bed and some wild winds. The dust devils were large and spectacular. In all honesty, I have never seen a storm like this again. It is my absolute favorite photo of a dust storm on the Alvord, and it will forever remind me of my mother because of when I took the photo. And, yes, I see a sort of “Hell’s Angel” on a motorcycle in the dust. What do you see? I had no intention of going down this road tonight, but there you are: sometimes you just end up on the path you take.